The 3D printer needs to be kept active so now and then. 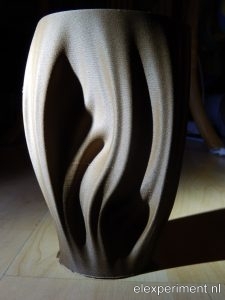 This post describes some experiments with printing spiral vases, using filament with wood fibres. 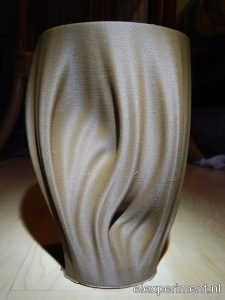 Printing spiral vases isn’t new, but the result of this print is quite nice. 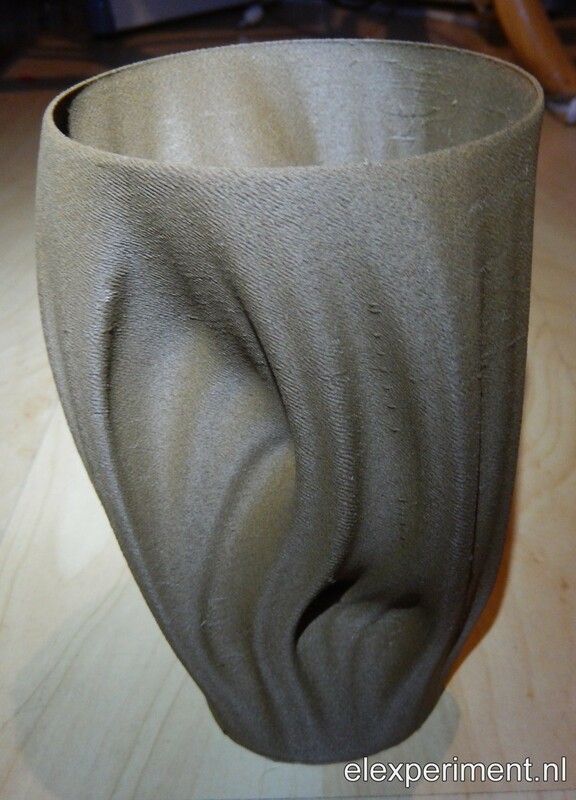 The object to print is one of the Julia vases by Virtox, the Stratus version to be specific. The filament was bought at 123-3d.nl. The trick of the “spiral vase mode” in Slic3r is that only one perimeter is used, during which the vertical position of the print head increases continuously. 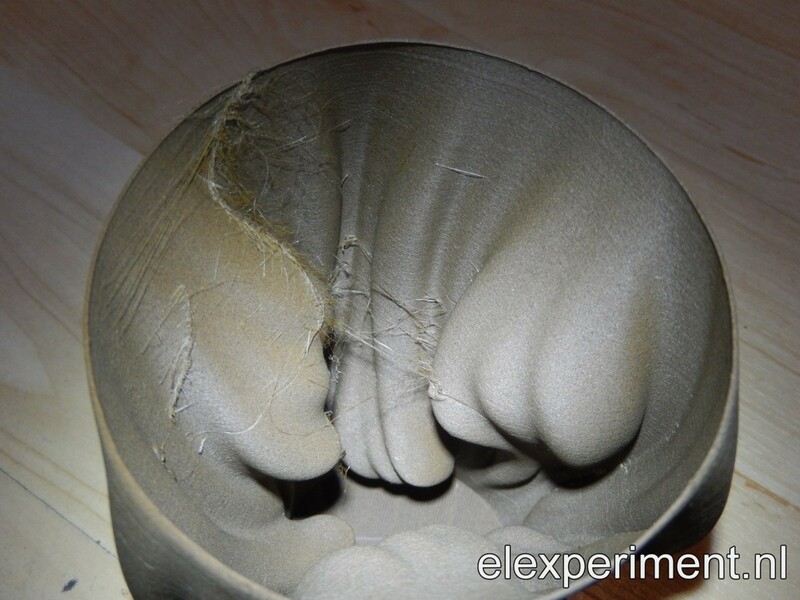 Usually the wall thickness needs to be quite thick, to reduce flexibility. 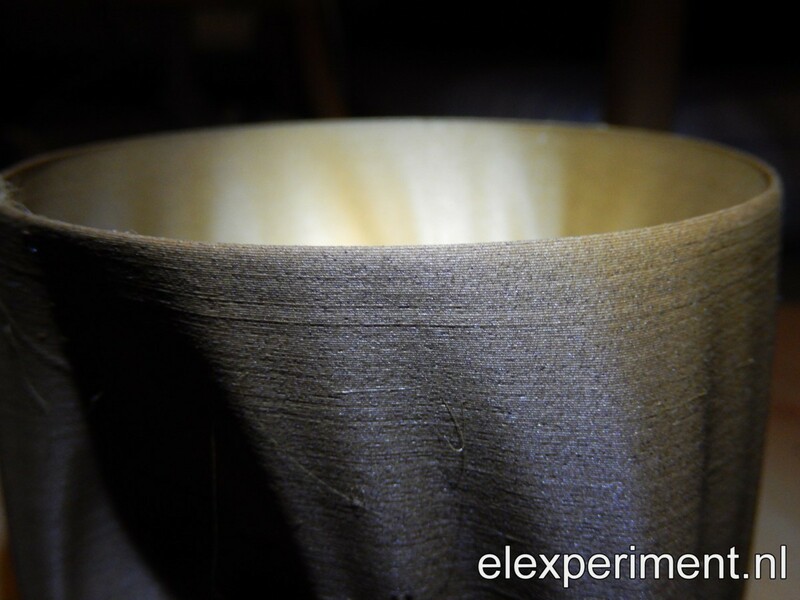 The first try was done with a 0.4mm nozzle and a 0.6mm wall thickness. The result looks good, but quite some material sticked to the nozzle during printing. So, assuming the clogging resulted from printing a 0.6mm wall with a 0.4mm nozzle, I switched to a 0.8mm nozzle and 0.8mm wall thickness. The clogging still happened, so apparently the filament is quite soft, which results in overextrusion. For future prints the material flow should thus be reduced a little. As you can see, the overextrusion is even more with the larger nozzle. Actually it looks (and feels) really nice, it has a very rough structure. Also, a large nozzle allows you to increase speed. I don’t have exact numbers, but the material flow was about 10mm^3/s for the second vase, which resulted in a print time of 1:20h. 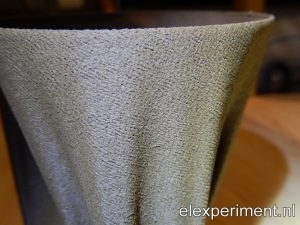 So far this 3D printing experiment. The next post will cover a nice experiment with eddy currents, large capacitors, high voltages, etc. It does also require some theoretical study first, which is taking some time. I think I’ll have to split it into multiple parts, to keep some progress in the project. P.S. These vases do make some nice photos.